My interpretation of this theme is perhaps an obvious one, an entrance to a beehive. 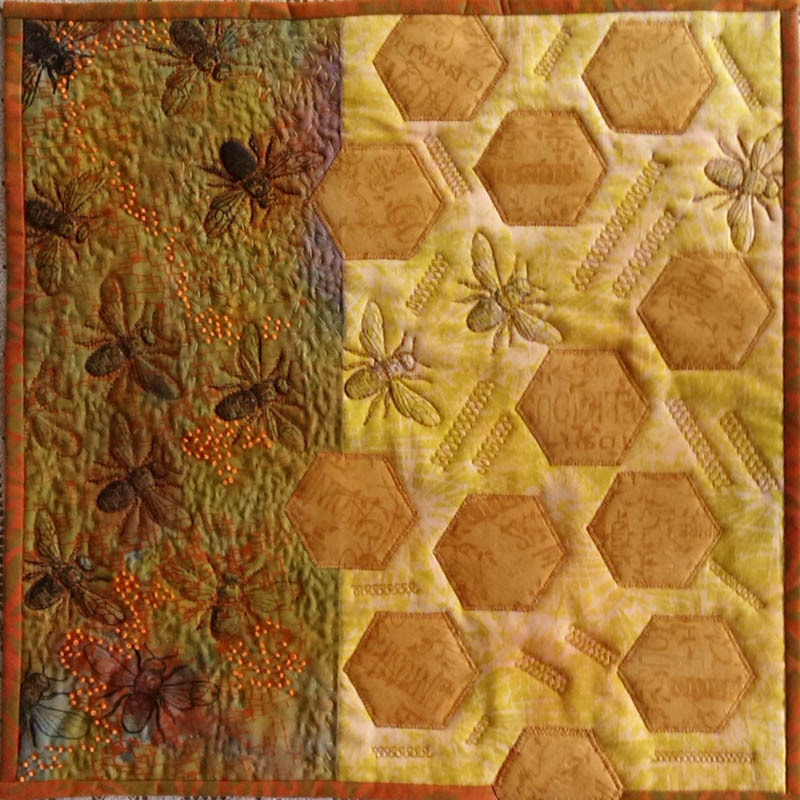 Bonded appliqué hexagon shapes applied to a hand dyed, printed background to form the hive and bee shapes printed onto a different piece of hand dyed, printed background, then joined together. I felt the placement of the bees was important, because I wanted them to portray a sense of flying home. The machine embroidery stitch used in amongst the hexagons was chosen because of its’ similarity in shape to that of the hexagons. However many times I tell myself to think carefully about doing continuous quilting, I never seem to remember and the fastening off of all the individual machining took a while! As the hand seeding and quilting progressed, I felt that it needed an injection of colour and the bright orange beads were added, which I felt provided that. 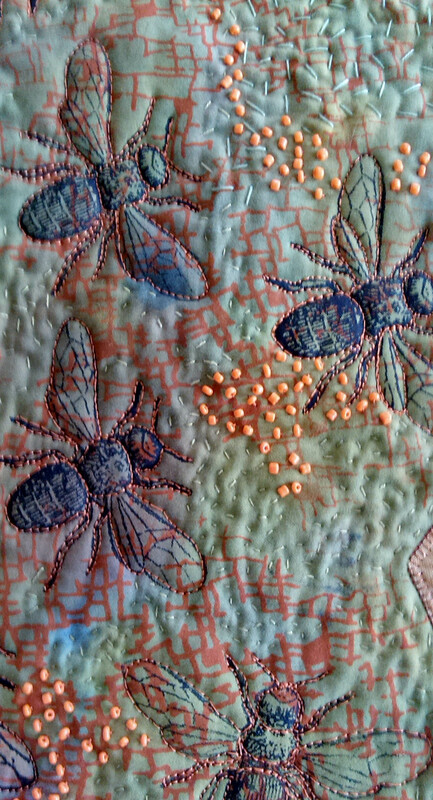 Freestyle machine embroidery was used on and around the bee shapes, which made them appear to be flying out of the quilt. A few lessons learned on this piece, I just hope I get to remember some of them. Another unique interpretation! Your fine stitching — by hand and around all those bees — is amazing, and the beads are reminiscent of the pollen the bees collect on their bodies as they seek nectar from the flowers. I like your interpretation ! and your work is beautiful. I love, this well worth the effort of finishing the ends!! You can almost hear the bees coming in. I love the combination of hand quilting and using machine embrodery stitches. A very good way to use them. A lovely balance of contrast and movement in this quilt. Just love all the detail and the lines of “honeycomb””. All very eye catching. I now feel the urge to start using embroidery stitches when I see the result you have achieved.